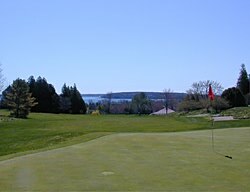 The Jewel is one of the most unique courses in the United States. Enjoy unparalleled scenic beauty, lush landscaping and meticulously manicured tees, fairways and greens. The Grand nine is located across the street from the hotel, with views of Lake Huron and Round Island. The Woods nine is set in the interior of Mackinac Island, with views of the Mackinac Bridge and the Upper Peninsula. After completing the Grand nine, you and your clubs will be transported via horse-drawn carriage a mile and a half to the Woods nine. 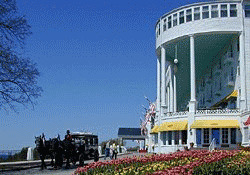 The leisurely 15-minute ride includes parts of the island unseen by many visitors. The Grand nine was built in 1901 and redesigned in 1987 by golf course architect Jerry Matthews. He also designed the Woods nine, added in 1994. Jason Horricks, a PGA Certified Instructor, is available for private lessons. The Jewel is open to the public. Rental clubs, golf carts and pull carts are available. To reserve tee times, please call (906) 847-3331 and ask for the Golf Shop.